The closest St. Thomas Hotels to the Cyril E. King Airport are the Best Western Plus Emerald Beach Resort and the Island Beachcomber Hotel. The air code for St. Thomas is STT. 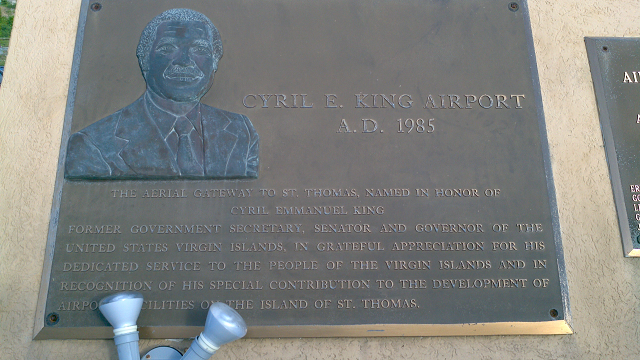 The Cyril E. King airport in St. Thomas is served by daily flights from Delta, American Airlines, Jet Blue, Spirit, and several regional carriers. Flying Delta, American, or Spirit will allow the visitor to St. Thomas to fly direct from Atlanta or the Miami Metro area, where as Jet Blue will fly via San Juan, Puerto Rico. Another option is Southwest which flys to San Juan where flyers could connect via a regional carrier. Once one arrives at the airport in St. Thomas, Taxis are standing by that can take them to their hotel, villa or ferry dock if traveling on to St. John, Tortola or another local island. There are different ferry docks depending on destination and 2 for St. John. The downtown ferry is about 45 minutes to St. John and the Red Hook ferry landing is about 15 minutes. A ticket from red Hook to Cruz bay, St. John is $7 for adults and are purchased at the dock. For the first time visitor, it is important to note that taxis on St. Thomas are shared. Large passenger vans are used, just tell the first driver in the taxi line up where you are going and he will either load you up or direct you to another taxi if he is headed another direction. Taxi fares to various points are standardized and quite fair so no need to worry about haggling, but please do remember that taxi drivers do work for tips. Find a St. Thomas Hotel on Booking.com - Looking for all inclusive resorts in US Virgin Islands? View of St. Thomas Airport from the parking lot. 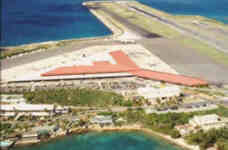 View of Cyril E King airport on St. Thomas US Virgin islands from Crown Mountain Rd. 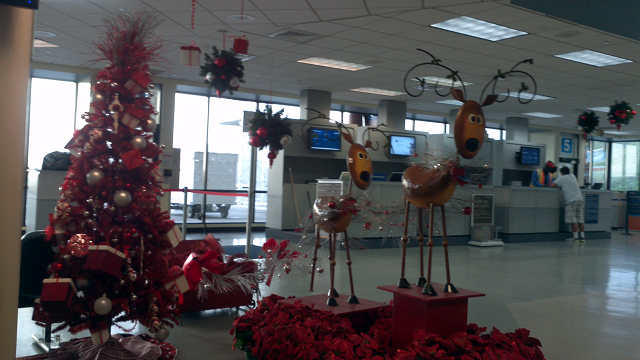 Holiday tree and reindeer in the St. Thomas terminal.